"Due to their high sensitivity to deep UV emission and insensitivity to sunlight, solar-blind photodetectors provide a wide range of important applications, including ozone damage detection, jet engine monitoring and flame detection," says Alexey Mikhaylov, head of the laboratory at the UNN Physics and Technology Research Institute. The main materials for creating solar-blind photodetectors are wide-gap semiconductors. 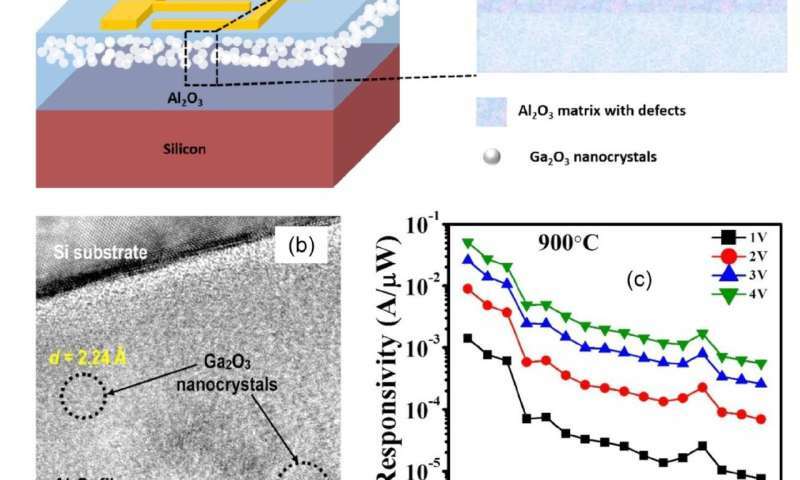 Nizhny Novgorod scientists, together with Indian colleagues, consider Ga2O3 to be a promising semiconductor with a band gap of 4.4-4.9 eV, which cuts off emission with wavelengths higher than 260-280 nm, and is capable of detecting emission in the deep ultraviolet range. The existing methods for Ga2O3 synthesis are quite complicated and incompatible with conventional silicon technologies. Additionally, the layers obtained by such methods often have many defects. The synthesis of Ga2O3 nanocrystals by means of ion implantation, the basic technology of modern electronics, opens up new possibilities for creating solar-blind photodetectors. Thus, the joint work of the international team of researchers from the Lobachevsky University, the Indian Institute of Technology Jodhpur and the Indian Institute of Technology Ropar has demonstrated the possibility of manufacturing photodetectors that cut off solar radiation (solar-blind photodetectors) capable of working in the deep ultraviolet region and possessing the characteristics that are not inferior to the existing analogs. "By producing such photodetectors with the help of ion implantation, it will be possible to use the existing silicon technologies and to adapt them to the manufacture of new-generation devices," concludes Alexey Mikhaylov.